Regular readers are likely familiar with the work of photographer Seph Lawless, whose hauntingly gorgeous images of abandoned malls and amusement parks have been regularly featured on the site. In keeping with his interest in forgotten places, Lawless recently paid a visit to New Orleans to document the city, and its people, a full decade after Hurricane Katrina made landfall. The result is a collection of photos that serves as a powerful and poignant testament to a resilient city that, 10 years later, is still recovering from the devastation of the costliest storm in America's history. More of Lawless’ work can be viewed on his Website, or by following him on Facebook, Twitter, Instagram, or Tumblr. "Meet Darrick Toney, holding up all 10 fingers representing 10 years of surviving Hurricane Katrina," Lawless says. "After losing family members and close friends to the catastrophe, Darrick was sent to Texas like many others. He would move back after seven years away and now lives back in New Orleans and struggles to assimilate back to his hometown." Images from a hotel/restaurant 10 years after the flood waters from Katrina. "The homeless population has risen almost 80 percent since Hurricane Katrina," according to Lawless. "I witnessed more and more people doing whatever they could to support themselves," says Lawless. "Sometimes not much more than what amounts to setting up a lemonade stand." 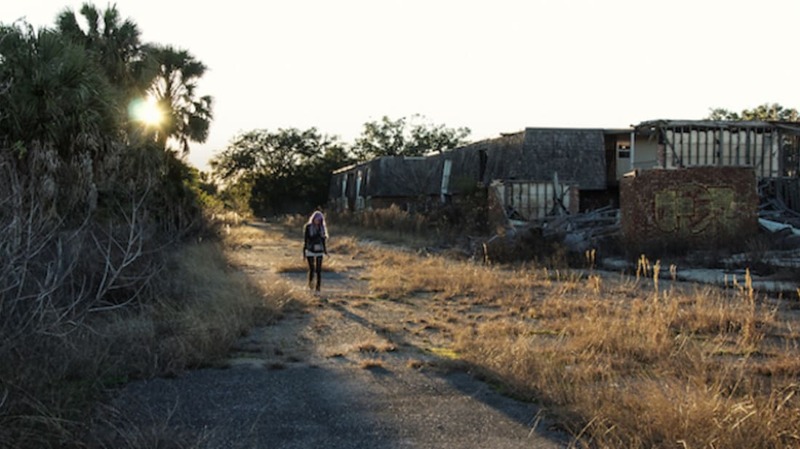 The Wanderer: "A local transient walks amongst the ruins of a nearby apartment complex littered with clothes and personal belongings," explains Lawless. "In 1960, several African-Americans' homes were removed to make way for the new highway overpass," Lawless explains. "Today, the overpass serves as gigantic umbrella against the summer sun for the homeless and local transients." Born from the Great Flood: Twin brothers Donovan and Devon, both 10 years old, "were born in the Lower 9th Ward just days after Hurricane Katrina," Lawless says. "They play near their home at an abandoned house." The Stairs That Lead Nowhere: "Perhaps the saddest images I've captured were the shots of empty stairs and platforms where houses once stood," Lawless says. "When I approached a group of men sitting on one of these structures in the Lower 9th Ward, a man pointed over to his friend and said 'This used to be his home.' The stairs that lead nowhere can be seen all throughout the most devastated areas of Hurricane Katrina. Sometimes right next to the new homes being built. [It's] a sharp contrast and sobering reminder of a painful transition." "'The Irony' Street name," Lawless says. While visiting the Lower 9th Ward, Lawless encountered a "displaced man taking refuge in an abandoned home that has a huge hole in the side of it from where a tree rammed into the house after flood waters devastated the area. The man now fishes and makes the best of his shelter." We Will Rebuild: "A church offers hope and plans to rebuild 10 years after Katrina," Lawless says. "'Vote Early' became a slogan after the disaster to encourage people to become more proactive in local government," according to Lawless. Ten years after being destroyed by Hurricane Katrina, this Six Flags amusement park sits eerily abandoned. The above images are all homes in the Lower 9th Ward, which famously suffered some of the storm's worst damage. "The hardest hit section of the city during Katrina was once the largest area of the city in which African-Americans owned homes," Lawless says. The Color of Hope: "Even though most of the hardest hit areas of Katrina are open fields and abandoned, several colorful, modern homes designed with solar panels [and] futuristic designs are becoming more prevalent," Lawless says. "Actors Brad Pitt and Angelina Jolie started this movement with community leaders years ago with a promise to rebuild the Lower 9th Ward with affordable housing." "Finally, I was able to sit down with FEMA's Ryan Mast to get old images of a few places right after Hurricane Katrina," says Lawless of his desire to create some before and after images, like the one of The Wilson School above, or two restored homes below. "I used those photographs to recreate them 10 years later. The same exact locations and shots—just 10 years later."